Can I grow tropical bamboos in my area? Can I trim and prune my bamboo? If so, how is this best accomplished? How does the container size relate to the actual bamboo size? Are the bamboo seeds (and seedlings) being sold from overseas sources legitimate? How do I care for my bamboo that grows in water & pebbles (Lucky Bamboo)? Are there any pests or diseases that infest or infect tropical bamboo plants? Bamboo culms (canes) emerge (shoot) from the ground from rhizome buds. They emerge with the same diameter as the final stem. All they do is grow longer in much the same way as a telescope, extending at a very rapid rate that can be in excess of three feet per day in a mature stand. When the culm has reached full height branches will start to appear and, depending on species, a new shoot can be fully developed within three months. During the shooting stage the new culm will be at least 85% water and it is imperative that regular irrigation is supplied to fill these vertical columns. Of course, standing water will drown your bamboo so make sure drainage is good. Until the branches form, the new shoots will be somewhat delicate and can easily break in storms or rough handling. A broken shoot will normally branch from the broken point and become a functional, albeit shorter, component of the clump. If construction timber is to be harvested, it takes at least three years for the water content to diminish, thus allowing he tensile strength to increase. A running bamboo is botanically classed as a "monopodial" species. It is usually a temperate zone originator characterized by the development of an open network of horizontal underground stems called rhizomes, from which the new culms grow. These bamboos are monoculture by nature but they can be successfully incorporated into gardens with underground containment barriers or just creative planting and maintenance. Most of these species are grown ornamentally in northern, temperate gardens (USDA zone 8 and below). This invasive habit has earned this group the name of "running" bamboo but the level of invasiveness varies greatly by species. Some behave much like a clumper and stay within a relatively small area. A clumping bamboo is botanically classed as a "sympodial" species. The larger of the species usually originate in the tropics and the smaller clumpers prefer the cooler mountain regions. The new growth shoots up from the underground base of the mother plant to form, typically, a group of culms radiating from the center and growing outward in a circular clump. The mature clump diameter varies by species but the average clump is 5'- 6' in diameter. Most these species are grown ornamentally in sub-tropical gardens (USDA zone 9 and above) but many of the mountain species cannot tolerate tropical conditions. 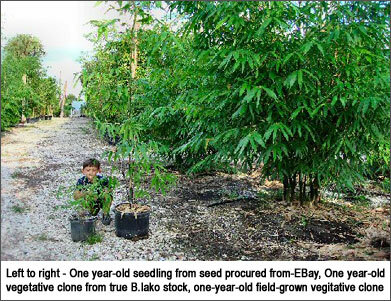 Tropical Bamboo Nursery grows the tropical species and growing areas in the U.S. include most of Florida, Southern Texas, Southern California, Southern Louisiana and Mississippi, Arizona, and Hawaii (we do not ship to Hawaii). Tropical bamboos can grow unprotected in sub-tropical areas of the United States - and these areas are limited. Generally, if you're in USDA zone 8 or lower, the Winter temperatures will be too low for extended periods of time for tropical bamboos to survive unprotected. These bamboos grow in areas where citrus, palms, gingers, etc. are easily grown. There are many temperate bamboo species that do grow in the northern areas of the U.S. (most of these are running bamboos and may need to be contained with underground barriers). We do not grow temperate bamboos, however, there are many on-line vendors. The minimum temperature listed in the description of each of our tropical bamboos is only one factor to consider when determining the suitibility for your area. More critical is the duration of the minimum temperature. A tropical bamboo listed with a minimum temp. of 27 degrees F may have no problem for one hour at that temperature. A sustained minimum of 31 degrees F for 3 hours could cause damage. Usually the leaves are the first to show damage and, if that is the only damage, recovery is quick. If the culms are damaged, you'll have to wait for new shoots when Spring arrives. If the rhizome is frozen, the entire clump will die (this would require the ground to freeze and, obviously, would be the result of sustained freezing temperatures for more than one day). Tropical bamboos can, and usually should, be trimmed for at least the reasons beneficial to any grass. Over years, they can become congested with their own dead culms and branches. Removing these will allow space for new growth. Additionally, live culms and branches can be removed, or shortened, for aesthetic purposes. There is not an exact answer to this as plant size can vary greatly by species and method of propagation. Generally, 3-gallon bamboos will be 1' - 6' tall. This size range is ideal for shipping and is also convenient for pick up (they easily fit in most vehicles) at our nursery. The 7-gallon bamboos range from 4' - 12' tall and many can be loaded into vehicles - sometimes with some creativity. A 15-gallon bamboo can be as short as 6' tall but most are more than 10' tall any many are more than 18' tall. Many of these are tagged by customers and scheduled for delivery ($2.50 per mile). This is also a popular size with landscapers/landscape architects. Field-grown bamboos are usually 12' tall and up (with the exception of B.vulgaris Wamin at 4'- 8' tall) and they are also normally tagged for delivery or for commercial pick up. Our field-grown bamboos are planted with measures that allow quick and minimal stress - they can be prepped and loaded in as little as 15 minutes. The number of culms in any container will be much fewer than a field-grown bamboo. Containers rarely have more than 6 culms and most have one or two. All container bamboos are well rooted, ready to plant, and will quickly produce multiple shoots in good conditions (full sun, regular irrigation, good drainage, occasional fertilization). That question is difficult to prove one way or another. All I can do is provide some facts, opinions and basic logic and let you form your own opinion. The U.S. government Code of Federal Regulations (CFR) can be accessed and searched online. U.S.D.A. Title 7 (Agriculture), Chapter III Part 319.37.2 (Prohibited articles) clearly states Seeds, plants, and cuttings of Bambuseae as being prohibited from general import from all countries into the U.S. It is an indisputable fact that bamboo seeds may NOT be imported into the U.S. unless they spend one year in one of the ABS post entry quarantine stations. Since Bambusa lako is the species most questioned as a seedling or seed source, I'll use this species in discussion here. It is a fact that there has been no recorded gregarious flowering of Bambusa lako in recent years. 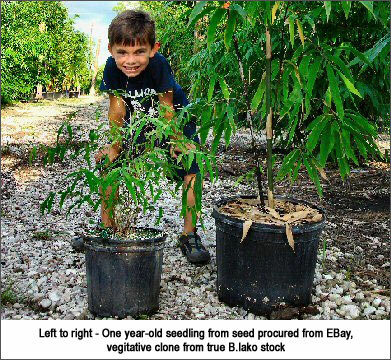 I seriously doubt the seeds sold as Bambusa lako will develop to match identical clones of Bambusa lako field specimens (this is my opinion). I would bet the farm (well, maybe not MY farm) that my seedlings will vary in either form, color, leaf size/shape, mature clump size, or all of the above. This would be a safe bet even if the seeds were collected from an isolated flowering B.lako. A nurseryman/friend once told me that germinating bamboo seeds was his most-fun propagation method. Not because he could easily produce hundreds of plants but because he never knew what would develop. Seedlings are rarely identical to the parent plant and often vary greatly (this is obviously a FACT). Most tissue culture protocols relative to bamboo are really micropropagation, not somatic embryogenesis, because the labs want clones not seedlings of the parent stock. So, yes, it is surely possible that an isolated flowering of Bambusa lako produced viable seeds. I've heard about techniques of stressing bamboo into flowering (hot coals poured onto exposed rhizome) so it could have even been a planned event (this is just conversation - don't try this at home). The conclusion is that, even in this best-case scenario, the seedlings will vary in appearance and vigor and it would be difficult to find a seedling that will mature to visually match its parent. In order to provide an objective source of information on the subject, this is an excerpt from an article written by Lennox Muller (On variation in seedlings, Bamboo Bulletin [Australia], Vol. 5, #1, April 2003, p. 17: "...While the subject of this article is hybridism in Gigantochloa, it serves as a warning also to growers of bamboos from seed, that while any bamboo seed can produce variable offspring, open pollination of different species in the wild can result in the formation of hybrids, which could be unwanted. The self-pollination of one of these hybrids in the profuse flowering of a single clump can result in further variability as described here. In my opinion, since propagation of bamboo by seed is laughingly easy and the plants produced can vary widely in both positive or negative ways, they should be sold very cheaply with a warning label pointing out that they are unproven seedlings and may give unsatisfying results. Growing plantation bamboos from seedlings and tissue-culturing unproven seedlings is merely for the adventurist." There are records available (Betty Shor/SoCal ABS) that track the flowering of various bamboo species around the world and most gregarious flowering events are very rare. Dendrocalamus strictus seems to be a seed-producing machine over the last decade. I have this species, grown from a 1995 batch of seeds (S.Lucas/Londono), that has the most distinguishing feature of tiny leaves. There were a few plants labeled as D.strictus at the 2005 ABS auction in Houston. The leaves were at least four times as large as those on my specimens. I asked the donor the source of his plants and he told me he grew them from seed. End of discussion. His seedlings could have varied from mine because they were seedlings (and surely seeds from a different flowering event). Regardless, it is fact that seedlings are not clones and whatever develops will be a new cultivar of the parent plant. Disproving the labeled identity of the seeds received would be nearly impossible as I hope I've illustrated in my comments. 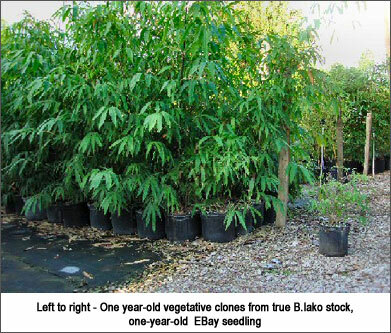 If, in a few years, the seedlings grown by countless buyers don't turn out to resemble the photos taken from websites of bamboo nurseries the seed vendor can legitimately state (as I have) that seedlings vary or maybe that the flowering B.lako was pollinated by another flowering species. If it's a scam, it's a perfect scam.